Does anyone remember these times? If so I would love to hear from them. left to right, back row ...Raymond, Florence, Bernard, and Harry at the front, all the Wiggin family. 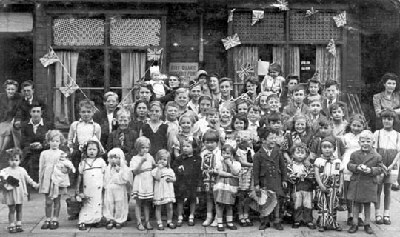 The photo was taken outside 37 Preston Road circa 1934. I lived in Winson Green most of my adult life. 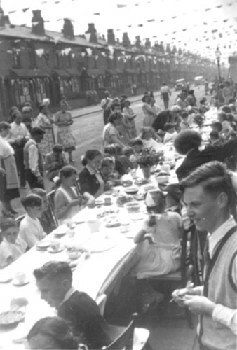 Living at three addresses, born at 37, married and moved to 17, then divorced and moved to 40, all in Preston Road.I went to school at Foundry Road, got evacuated to a village just outside Evesham, came back after four years and finished at Handsworth New Road girls school. Neighbours were great, the Inett's the Fields, myself and my four brothers called them aunties and uncles. Brothers Bernard, Raymond and Harry were conscripted during the war to the forces. Danny was to young to join up. What vividly stays in my mind was the bath saga, firstly a long tin bath was bought into the kitchen, all of us taking it in turns, with hot water topping up existing water. Then we all went to the public baths in Bacchus Road, queuing up outside to get in. When we bought 17 Preston Road we had the back bedroom converted into a bathroom, luxury. We never had holidays as children, our day out was to the Licky Hills, great fun.Us kids sat at night with mom making peg rugs. We had concerts in the house, mom sang, dad played the spoons, Ben played piano, Ray the comb and paper and Harry played drums on saucepans with pegs, I tap danced ( or tried to ) No telly, no phone, no mod cons, but a happy family life. 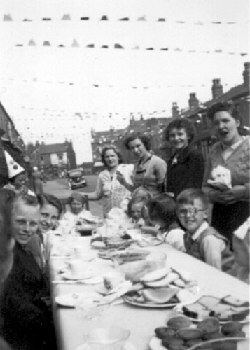 I would like to say thank you to Florence Ward (nee Wiggins) for putting the photographs on the internet of Preston Road. 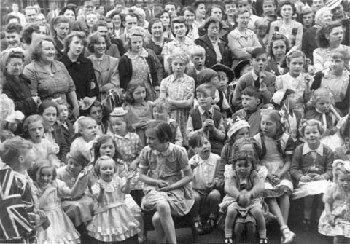 I am in the photograph of Queen Elizabeth's coronation in 1953, I am on the back row (with the big white collar) as i was dressed as Queen Elizabeth 1st. My father and mother lived at number 47 preston road they were called Albert and Violet Jinks and i was born there in 1941, next to us at 45 lived the masons they had two sons Bobby and John and at number 43 my aunt and uncle lived they were called Cyril and Kitty Massingham, my sister Joan and my brother Ernie also lived in Preston Road until they got married. I went to Foundry Road school and then on to Handsworth New Road school, I left school in 1956 but lived at number 47 until I got married in 1963 and now live in Devon. Dear Ted this is such a great site - well done. My Aunt Floss (Florence Ward nee Wiggin), who contributed to your Preston Road section, sadly died earlier this month. As she said, she lived in Preston Road for most of her life and had lovely memories.